Georges St-Pierre may be temporarily retired from mixed martial arts, but fans will still see their favorite Canadian in his first major acting role as he goes opposite Chris Evans in the new movie ‘Captain America: The Winter Soldier’ opening in theaters on April 4. 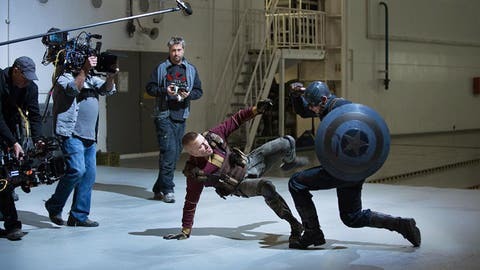 This week, Marvel Studios released a few photos from the upcoming moving including an action shot that sees St-Pierre’s character – French savate kickboxer Batroc the Leaper – take on Captain America. St-Pierre filmed the movie of the course of just a few days last year so it’s hard to tell how big or small his actually part will be in the film, but the character of Batroc has been a mainstay of the Marvel Universe since he was first created in 1966. St-Pierre is still currently enjoying some down time at home in Canada after surrendering his UFC welterweight title recently so he could take a step back from the sport and get out of the spotlight of the fight game. He may still pursue some acting roles in his down time, however, and he’s sure to get plenty of exposure after appearing in what is expected to be one of the biggest films for all of 2014. Captain America: The Winter Solider will also debut a new trailer at the Super Bowl this year so maybe St-Pierre will make an appearance there as well.